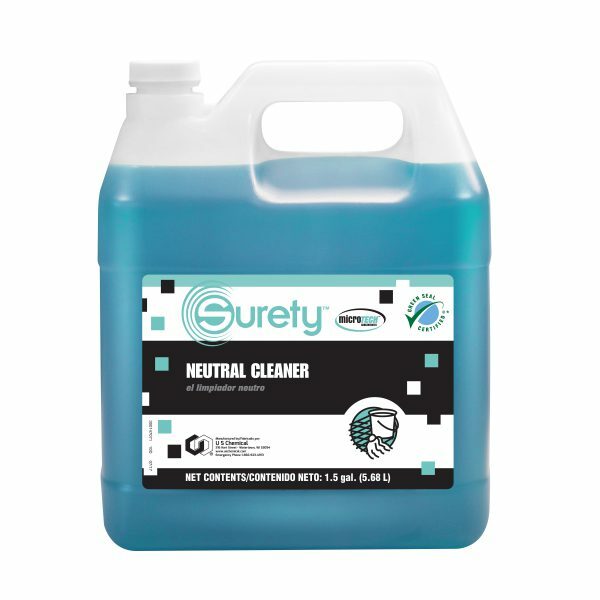 Surety™ MicroTECH™ Neutral Cleaner is formulated with a detergent system that provides the performance of a general purpose cleaner. This product is pH neutral so it won’t damage or dull the shine of the floor finish. Surety Neutral Cleaner is safe for use on most floor types and washable surfaces. It does not require rinsing on non-food contact surfaces and can be used in buckets, spray bottles or in automatic scrubbing machines. Surety Neutral Cleaner is a low foaming product. Not for use on food contact surfaces.